There’s a new addition to the world of Minecraft in the form of Lycanite’s Mobs Mod. Full of scary and thrilling new possibilities, this mod is sure to excite any dedicated Minecraft fan. After downloading Lycanite’s Mobs Mod, Minecraft fans will revel in the evil monsters that are programmed to attack them every so often, making it a challenge to gain further ground in the game. For instance, the Lobber is a vicious creature who lives in lava and lobs fire at you, the player. The Pinky Demon is another monster who bares an incredible resemblance to one of the bulldogs from the Demon Series. Some mobs, although vicious, can be made passive and even useful to you as the player. You will meet the Ventoraptor, a giant predatory bird, not unlike a vulture, who can be tamed and turned into a mount. You can then use this mount to travel in style through your various biomes. 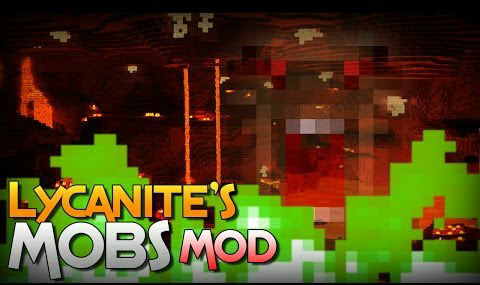 In addition to the evil mobs that await you, Lycanite’s Mobs Mod offers a plethora of new biomes for you to explore. Now, you can battle it out in bodies of lava, for example. You are no longer restricted to water, land and air. With highly customizable biomes, you can make the world of Minecraft truly your own unique space. If you are not yet afraid of the world you’ve created in the game of Minecraft, there’s a strong chance you will be caught off-guard with this mod update. Gone are the blocky graphics of the Minecraft of yesteryear. They are being replaced with the more lifelike, realistic entities introduced in this version of mobs. They may look out of place in your world at first, thanks to the crisp, life-like animation, but you’ll get used to them as they thrill and frighten you to play at your very best. When you meet the Concapede, you may be of the opinion that Lycanite’s Mobs Mod 1.10.2 makes Minecraft a scary world indeed. The detail in which this monster derived from myth is depicted is astounding and quite believable.